The white-hot topic of drought is spreading across the northern Nevada desert this summer and wild horse activists are accusing the U.S. Bureau of Land Management of exploiting drought conditions to accelerate and expand its goals of removing hundreds of mustangs from Nevada’s ranges. The BLM has in past years already significantly diminished the mustang population in Nevada and throughout other western states, in what some activists allege is a contrived effort to ensure more forage for cattle. 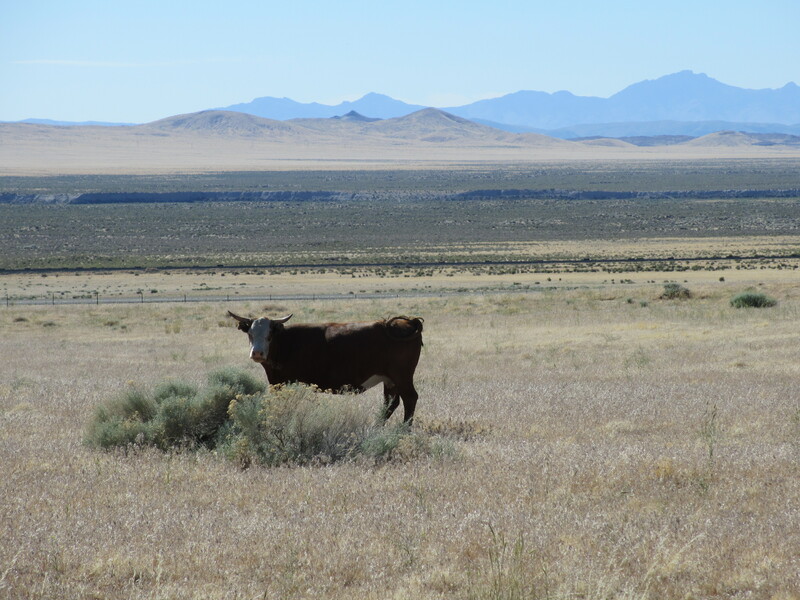 Cattle provide revenue to the BLM from ranchers who use public lands to supplement grazing. The BLM contends that the removal of the mustangs from public lands falls within its appointed duties of managing the range and its resources. The agency cleaves to its position that removing the mustangs protects and preserves other wild range animals by creating a more equitable distribution of food and water. It also claims that its actions benefit the mustangs themselves. My husband and I recently returned from camping in the northern Nevada desert where the heat was oppressive. Heat ascended endlessly from the desert floor and filled every inch of air with an incandescent blur. It rendered much of the forage tinder-dry, except in canyons where watersheds provide added levels of moisture. It conjured arid winds that scooped dust from the ground and flooded the sky with it. In such incendiary conditions, every animal there is fighting for its life, including the cattle and the mustangs. The primary difference between those two is that cattle dependent upon ranchers are receiving the care they need, while mustangs are dependent on an agency that might have succumbed to a conflict of interest. Mustangs, however, have survived before in drought conditions, in Nevada and historically. There was a time in the western United States when one would have expected that the ranchers and the mustangs were on the same side. In truth, however, while ranchers have historically benefitted from mustangs by using the hardy and spirited horses to herd cattle and sheep, they simultaneously resented the competition for forage from those mustangs that remained on the range. While we can entreat ranchers to respond more empathetically to the mustangs, we expect the BLM to hold to legal and ethical standards. Competition and conflict are certainly not new concepts in the ministrations of our government agencies. As our country’s population grows and with it demands on our resources, it is incumbent upon our government to respond humanely to the fallout from these developments. In the case of Nevada’s public lands, that is the role with which the BLM is charged; whether the agency is succeeding remains in question. Relative to the mustangs, the agency’s methodologies seem to contradict its purported mission. At best, the methodologies have produced adverse consequences which we could assume were unintended if it appeared that, overall, the agency is taking to heart the welfare of the wild horses. In recent years mustangs, which the BLM contends it is protecting from lack of forage, have been terrified and chased by helicopters for hundreds of miles through a Nevada desert terrain that is treacherous with volcanic shards. They have been transported to warehouses and held without hope of release. They have died in captivity of depression, the inability to digest non-native food, and illnesses or injuries born from overcrowded corrals. They have been castrated in captivity and in the field. The mares, in their physical or emotional stress, they have lost foals. The herds’ very sophisticated social and family structures have been ruptured, as some of the wild horses within a herd are captured and others remain on the range. On June 20, only hours before my husband and I left for our vacation in the Nevada desert, a federal judge in San Francisco ordered the Bureau of Land Management to suspend its use of helicopters to round up wild horses in the northern section of the Jackson Mountains of Pershing County, Nevada. The judge’s decision centered on the fact that the BLM had failed to prove a drought in that region and, therefore, the agency was violating its own rules by using helicopters to round up mustangs there prior to July 1st, the end of foaling season. Such blatant disregard on the part of the agency for the welfare of pregnant mares and their unborn foals can hardly be defined as ethical, much less caring, stewardship. The same judge allowed the BLM to continue its use of helicopters to round up mustangs in the southern portion of the Jackson Mountains where the BLM successfully proved drought conditions and therefore that it was within its rights to use helicopters for a round up during foaling season. The request for an injunction was brought to U.S. Federal Court by Laura Leigh of Minden, Nevada as part of a larger lawsuit against the BLM and its removal of and treatment of Nevada’s wild horses. Leigh argued that the federally protected horses have more of a right to remain on the range during drought conditions than the BLM-permitted sheep and cattle. Great story. Have you considered submitting this to a magazine? It seems truly newsworthy, and I would think High Country News or similar periodicals would be interested. Thank you. I’ve been following developments around Nevada’s mustangs for a while now, hoping the trend would reverse. I appreciate your suggestion to submit the story for publication and will take it into consideration. I have found that in general Nevada publications tend to give minimal attention to the wild horse issue, perhaps because they have ranchers among their subscribers. But then I have by no means exhausted the sources/possibilities. The issue has been covered in national publications such as National Geographic and The Smithsonian. Thank you again for your interest and your comment. Thank you for this informative post. Thanks for visiting my blog. I hope you stop by again. Thank you for your interest. Many people who are not directly connected with our western ranges are unaware of the problems which confront our mustangs. Awareness is the first step toward an ethical and humane solution. I enjoyed your blog and will visit again! It is indeed a tragedy. So since you are a wild horse advocate what about the horses that are on I80 on the way to Virgnia City that are starving and have sevre injuries. You live right around the area. What is the state doing about them since they are not BLM horses and don’t fall under the Wild Horse Protection Act. The pictures of those horses are horrific. I haven’t seen any pictures from you though. Perhaps you are confusing me with someone else? I don’t live in the Virginia City area, nor have I seen the horses or the photos to which you are alluding. Nor would I describe myself as a wild horse activist. I wrote this piece, as I told the first person who commented upon it, because I have been following the BLM’s inhumane treatment of mustangs for a while now, hoping the trend would reverse. I am unclear as to the intent of your comment. Are you objecting to my objection to the BLM’s inhumane treatment of wild horses? Or are you dissatisfied with the scope of my piece because it does not address the Virginia City horses to which you allude? This is a nice way to start my day. Thank you! I’m very honored. May I use your drought/bull photo on my website? Hi Lizzie, What is your website address? I don’t seem to be able to link to it from your gravatar. very, very informational! amazing post! Thank you. The events surrounding these horses are heartbreaking.